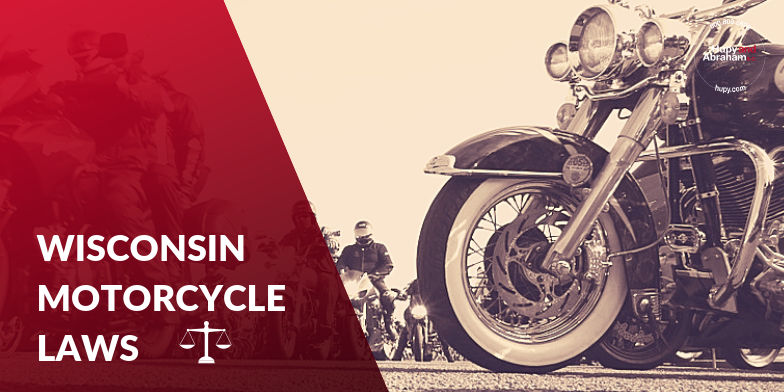 Wisconsin State Motorcycle Laws | Hupy and Abraham, S.C.
Motorcycle use, like the use of all other motor vehicles, is regulated by the state of Wisconsin. It is important to abide by these laws to avoid getting ticketed, and more importantly, to avoid getting hurt in a crash. However, before you can comply with the law you need to know the law. Every operator of a motorcycle must have a class M motorcycle license or motorcycle instruction permit. All riders under the age of 18 must wear a motorcycle helmet. This includes passengers under the age of 18. All riders under the age of 18 must complete rider education. All motorcycle riders with a learner’s permit or instructional motorcycle permit must wear a helmet. All motorcycle riders must have eye protection, consisting of a windscreen, a helmet shield, glasses, or goggles. All motorcycles that are in use must have a headlight turned on—even during daytime hours. All motorcycles must be equipped with turn signals, one rear-view mirror, and a muffler. Additionally, handlebars may not be more than 30 inches above the seat level. All motorcycles must have a passenger seat and footrest if they will be carrying a second person. Two motorcycles may operate next to each other in the same traffic lane. The use of helmet speakers. Passengers of any age may ride a motorcycle with a licensed driver. Motorcyclists over the age of 18 and those who have a full license may decide for themselves whether or not they want to wear a helmet. These laws apply to motorcycles that are used on public roads—including interstates, state roads and local roads. Different laws apply to the off-road use of motorcycles in Wisconsin. Motorcycle laws, like all laws, can and do change. Thus, it is important to stay up-to-date on motorcycle laws through training classes, the Wisconsin Department of Transportation, our website, and other reputable sources. How Much Motorcycle Accident Insurance Do You Need in Wisconsin?